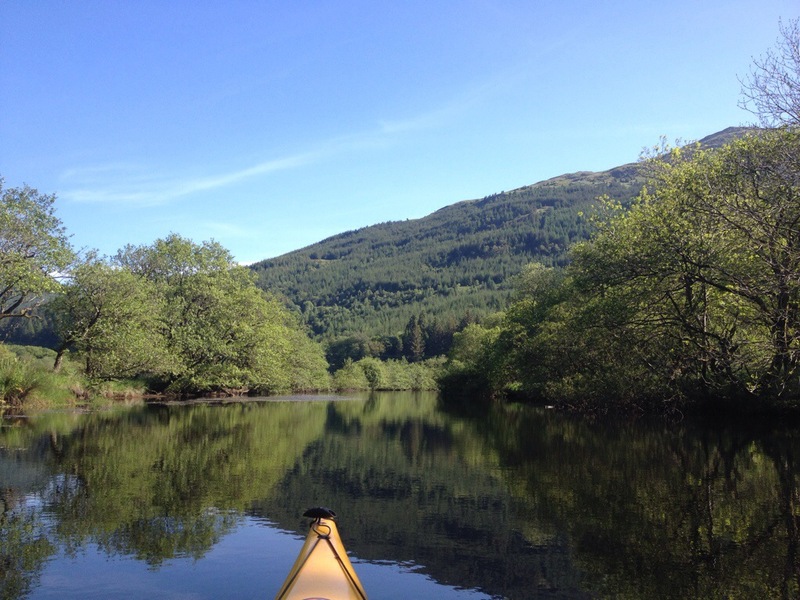 Saturday morning and again I was heading to Loch Eck. 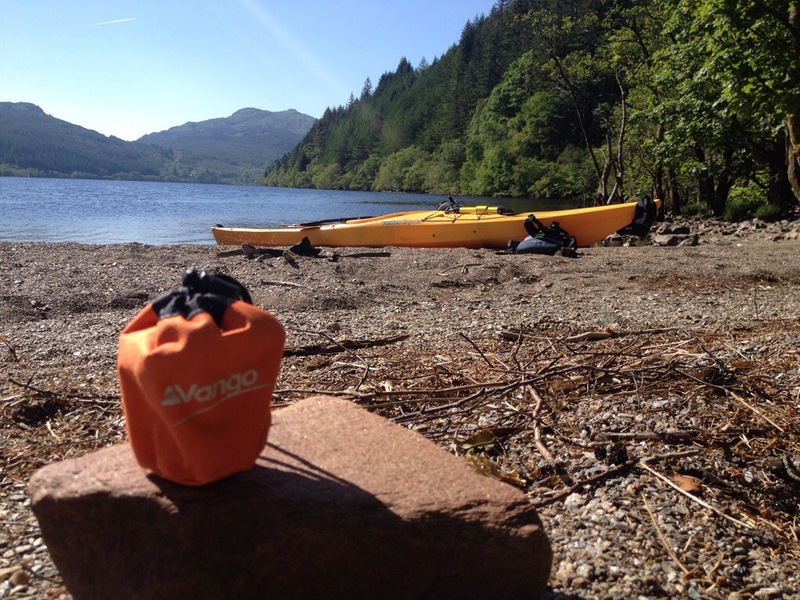 This time with a purpose…to find a spot for a nights camping. 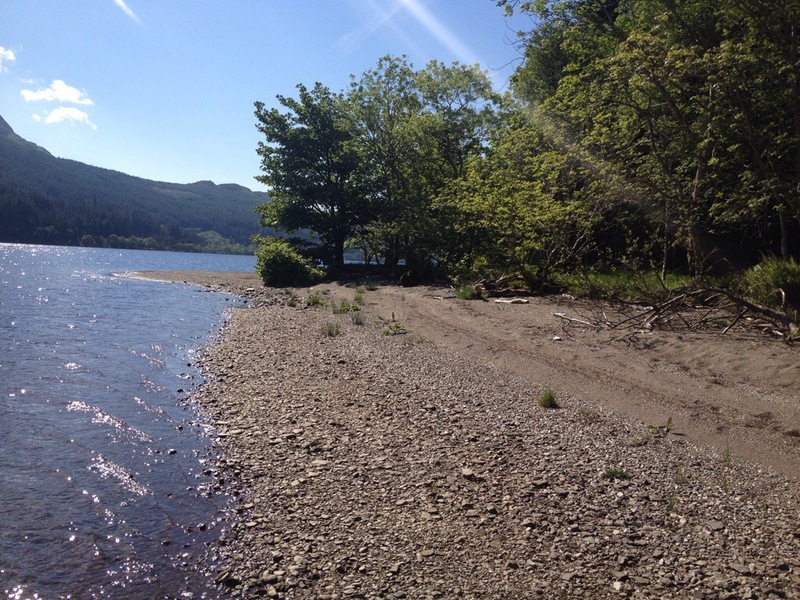 There’s a couple of large beaches on the Loch,but was looking for something different. Also wanted to try out my new stove ( Vango Ultralite,73gms) ,have had it for ages and testing it in the garage just isn’t the same. The beach has great views and usually has on side that’s sheltered from any wind, or the options to head into the trees. After the beach stop I headed North to the River Cur just to give the arms a work out…….looks like alligator territory up there!!!! 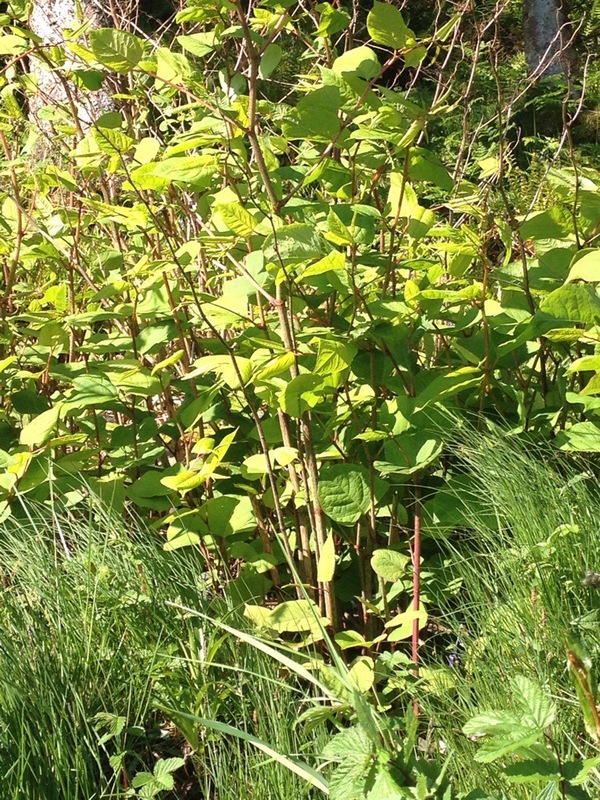 Whilst paddling I did notice some areas of the dreaded Japanese Knotweed growing!!! 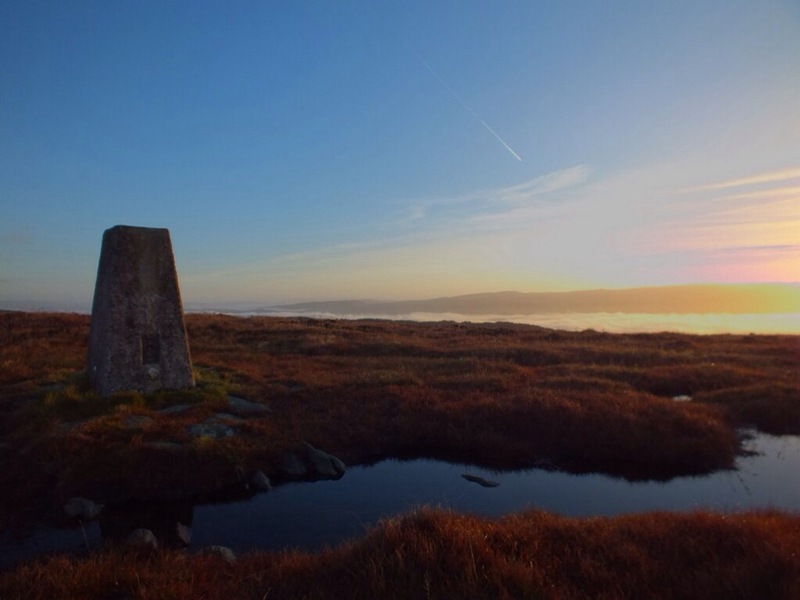 Having received an email from a member of the local walking group to record any locations I got some pictures and reported back. Hopefully the organised group will be able to treat and eradicate the problem on the shores. 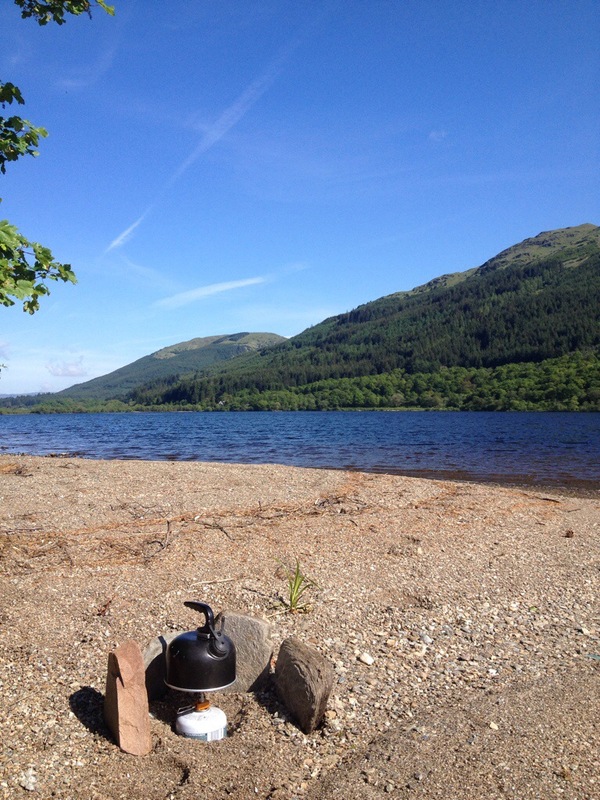 Looking forward to the next visit to this beach……maybe even with the tent. 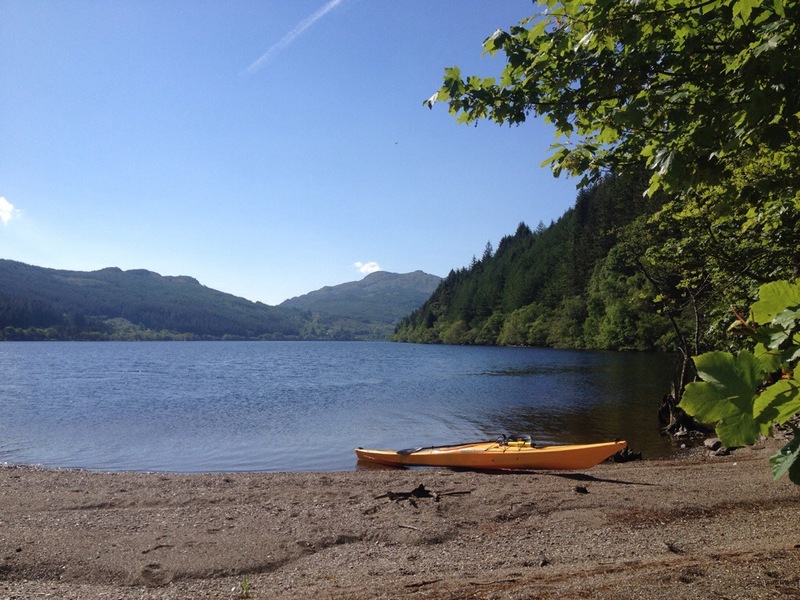 A paddle on Loch Eck was well overdue,roughly 7 months was the last time I paddled here. With a new vehicle sourced and a roof rack fitted last weekend,there was no holding me back ( well work and weather permitting,ha). 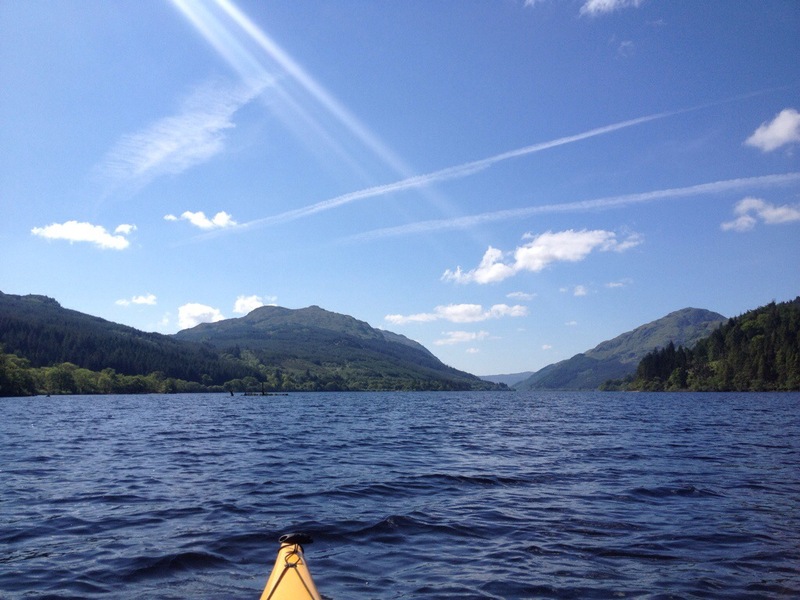 Loch Eck it was !!! 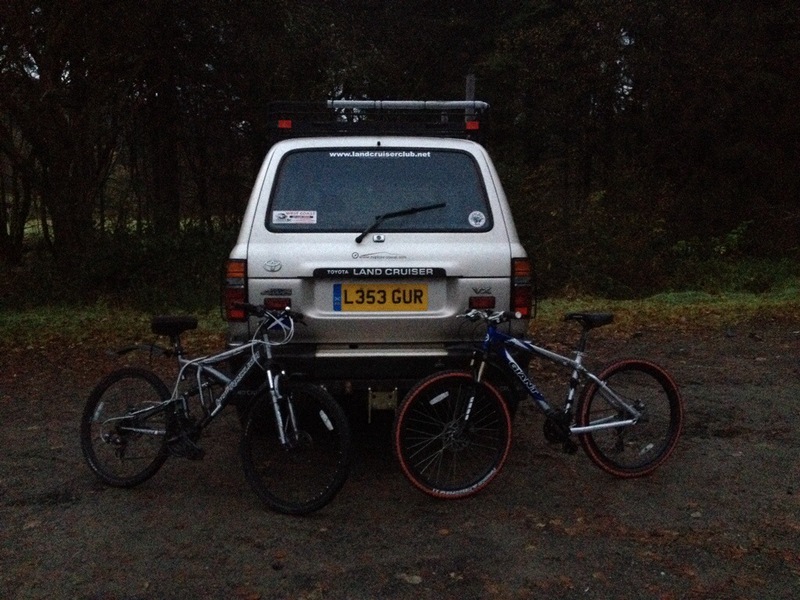 Loaded up after work and took the 20 minute drive north of Dunoon. 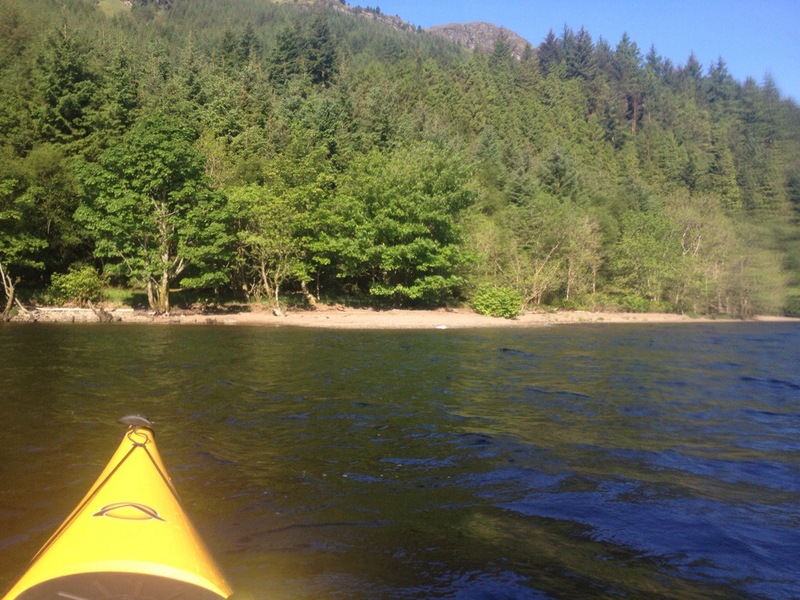 Loch Eck has a number of possible launch points and there’s usually at least one that’s sheltered from the worst of any wind. 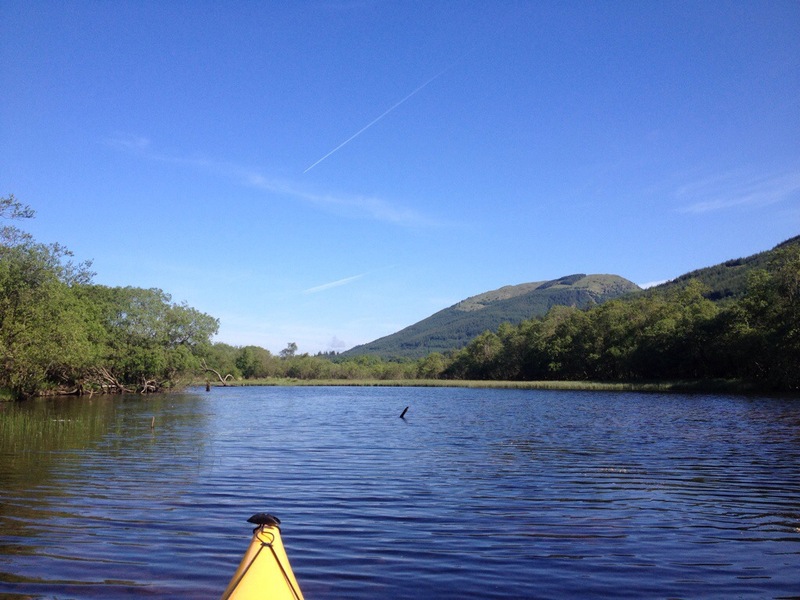 I chose to launch at the north end of the Loch at Dornoch Bay. 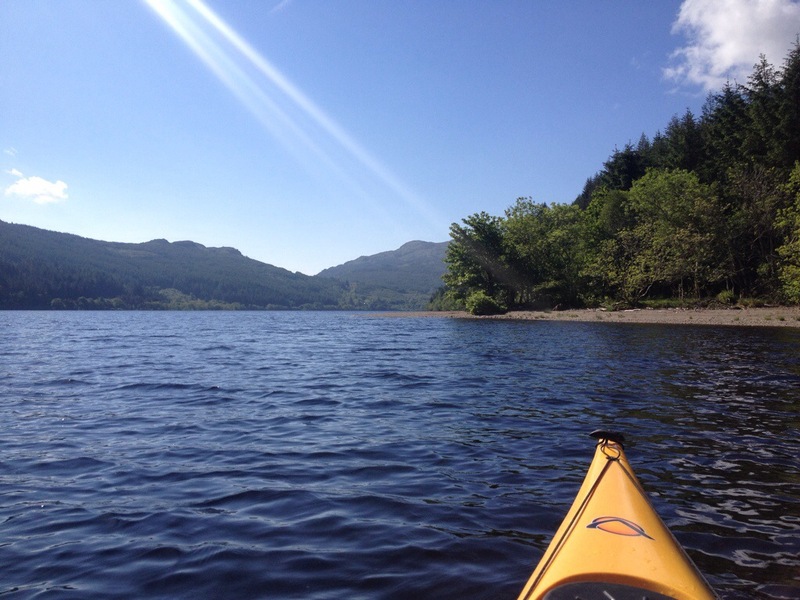 With no set plans I decided to paddle south to Jubilee Point then cross the Loch and return on the west side passing the ruin of Stuck Farmhouse. In the short time I had on the water I think I spent more time taking photos than I did paddling ,but in the conditions it’d have been rude not to. Another great cycle. Heading out on forestry roads and returning on main roads. 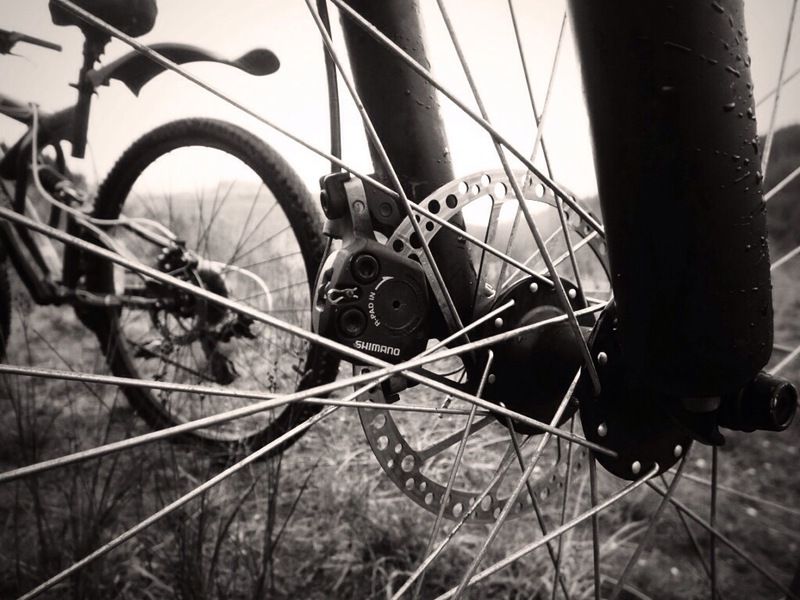 Whilst I’m not a great fan of cycling on main roads, at the time the route worked for me. 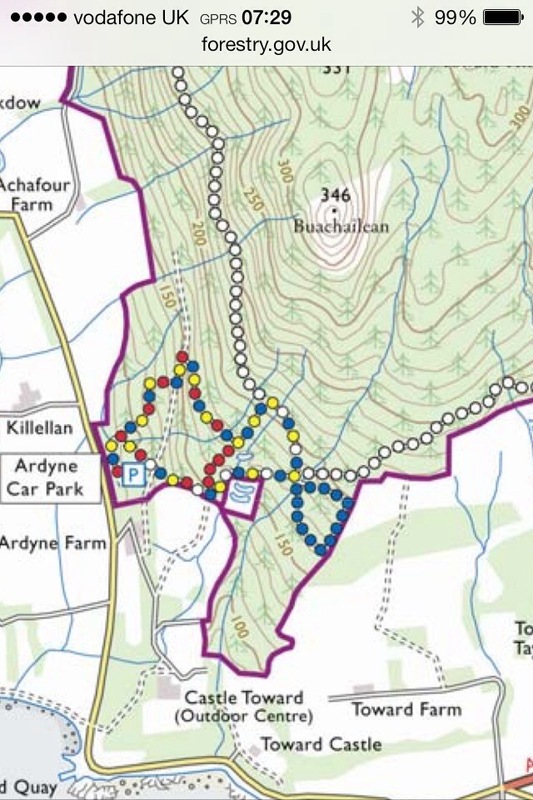 Again, there’s plenty of options of start/finish/turning points if you want to extend/shorten the route ( Kilbride car park,Ardanadam etc). 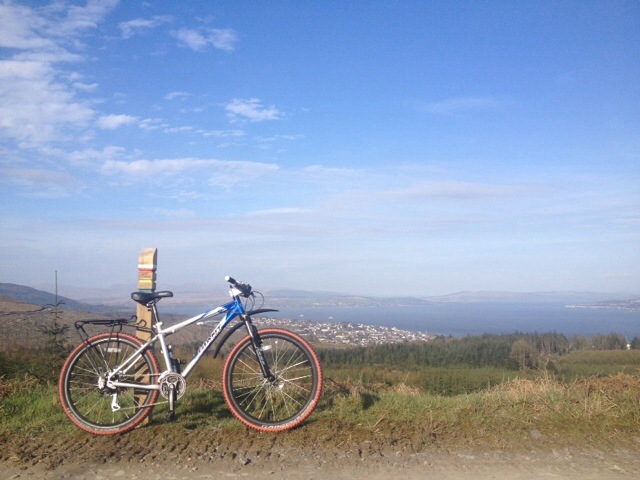 I chose to start at the top of a John Street in Dunoon. 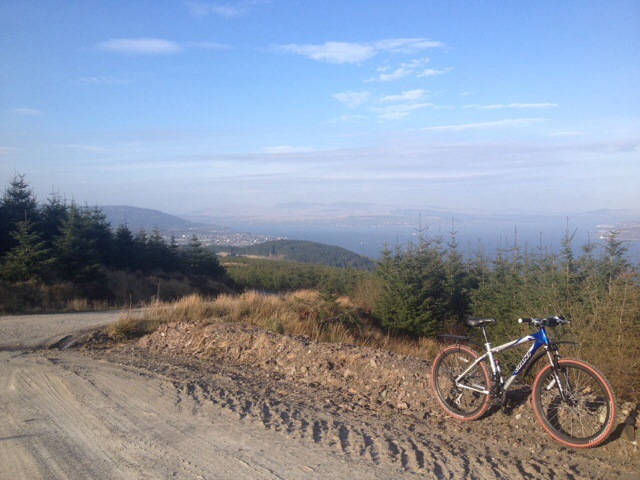 Easy access onto the forestry road which pretty much climbs all the way till your above Dunan. There’s some great views over the town before you take a left where the road splits,climbs and continues through a gate up to Dunan. There’s a mast on the bottom side of the road but continue straight ahead on the new section of link road. It’s an easy cycle from the mast and your soon ‘bombing’ downhill till you come to a signposted junction. 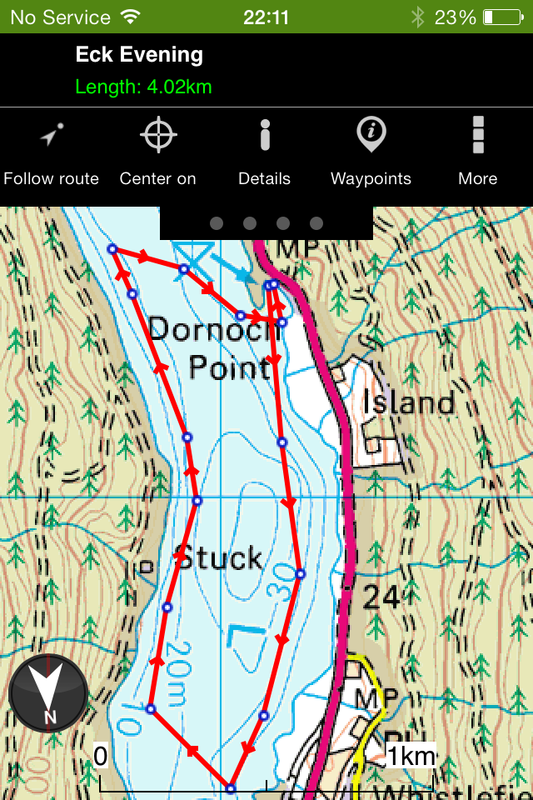 Here I took a left for Glenkin opting out of the shorter Sandbank route. 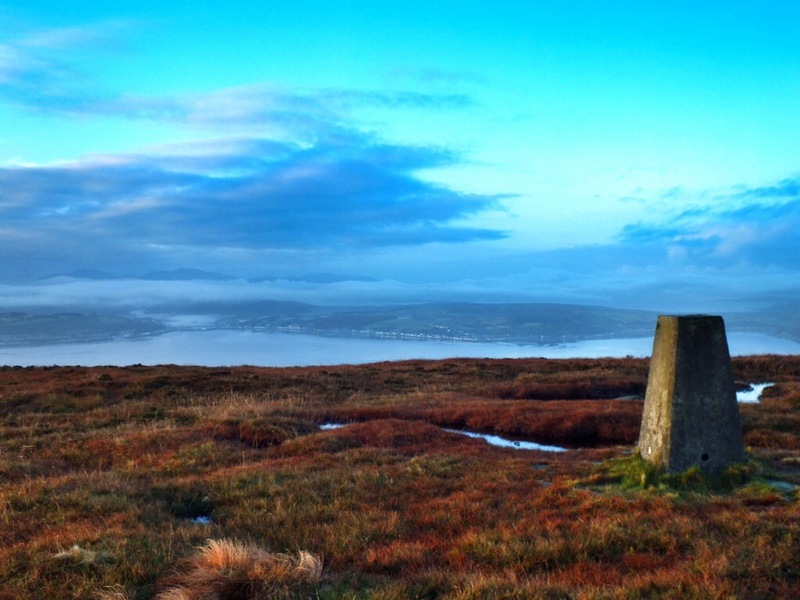 After turning left a small climb to the brow of the hill, giving views over Hunters Quay and Strone. 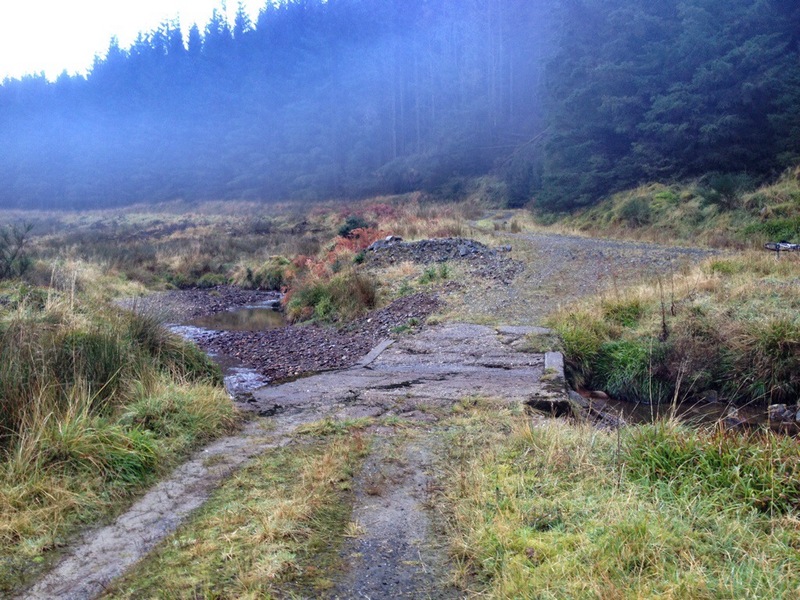 At the time I cycled this section there was quite a bit of forestry activity, so it was necessary to dismount at the loading lorries and move on when prompted by the drivers. Didn’t fancy my chances against a couple of ton of timber swinging about! 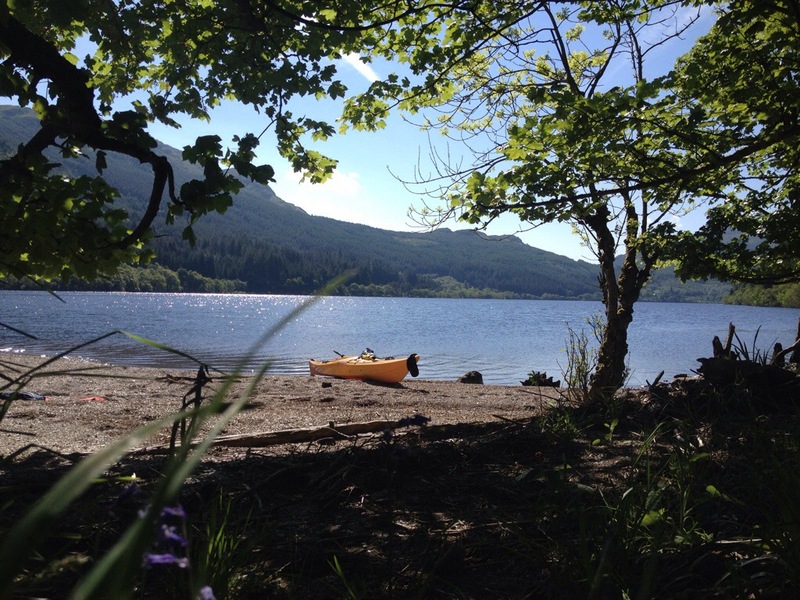 Once through the ‘active site’ there was a great view down the Holy Loch and Ardanadam pier. From here it’s pretty much down hill all the way to the B836. Again there’s a sign post at the next junction offering some navigation help. 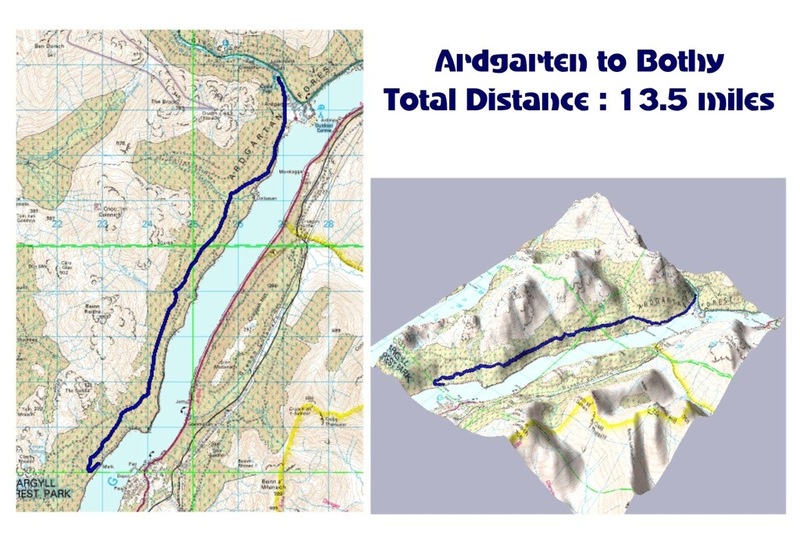 The Glenkin option is roughly and additional 6 miles if you fancy adding another loop. Heading downhill for the B836 there’s a sweeping bend to the right, follow this to the rumbling bridge. 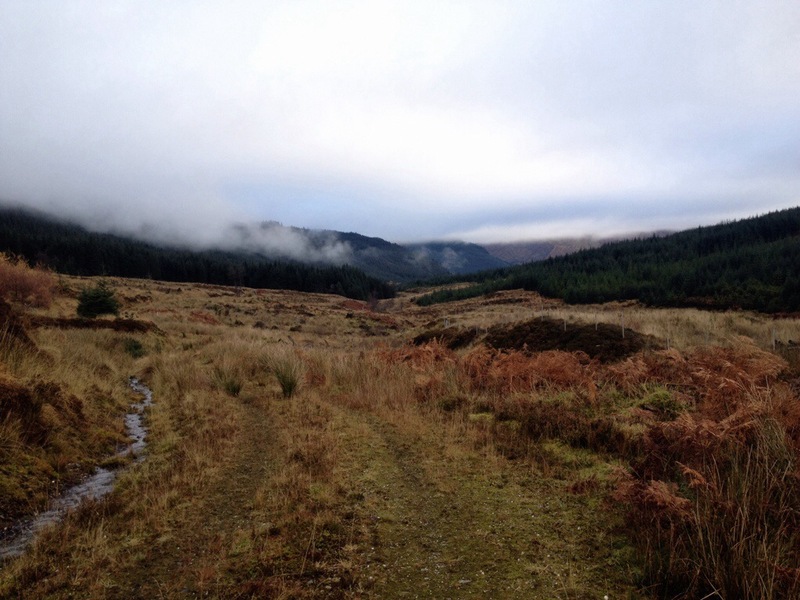 The road to left is the middle road that takes you to the Glenkin Outdoor centre and continues to top of Glen through two Fords. 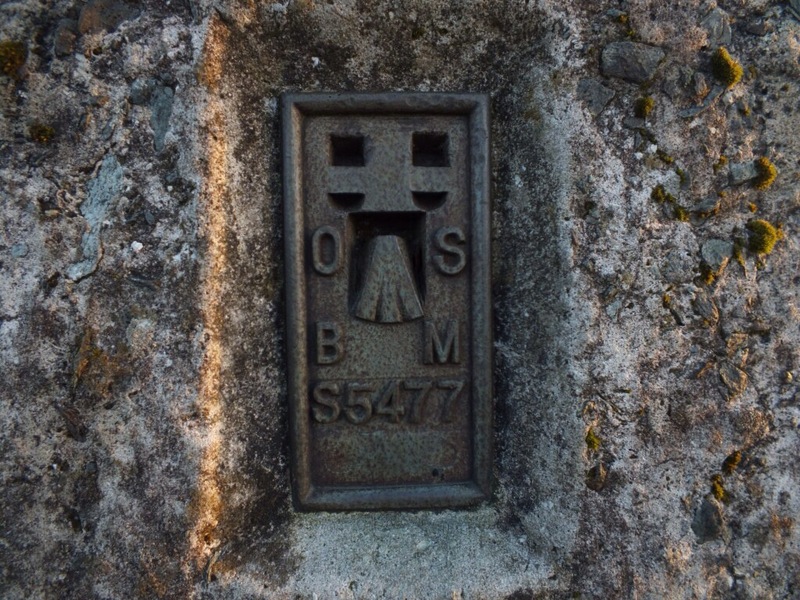 Once on the B836, it’s down to the junction of the A815, turning right for Dunoon. Nice easy road miles,one climb on the High Road at the primary school. morning. With plenty of scope to add/subtract miles. Dunoon to Innellan and return. 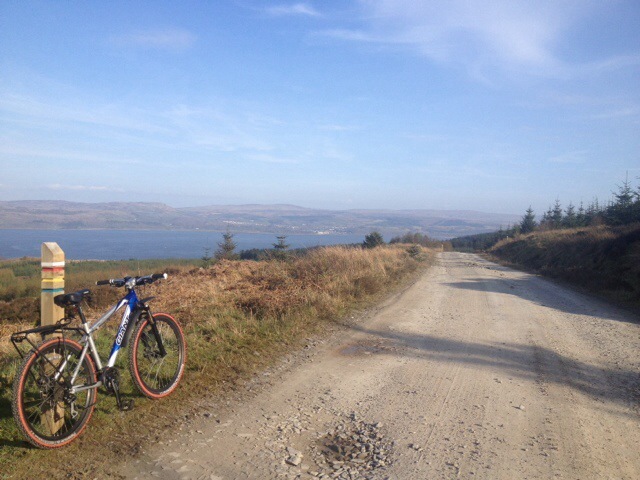 A great cycle with few climbs. 10 (ish) miles all in. Forestry road and main road. Completed this cycle one night after work, taking advantage of the lighter nights we now have. 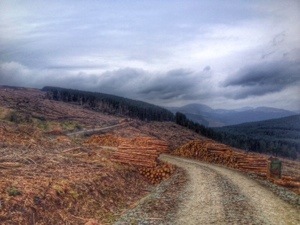 Leaving from Kilbride car park following the forestry road, a quite straight forward route. The first climb of significance is from where the road splits to the new link road and bridge. Continuing straight on you wind up the hill and follow it as it switches back carrying on climbing till you get to the bench overlooking Dunoon. 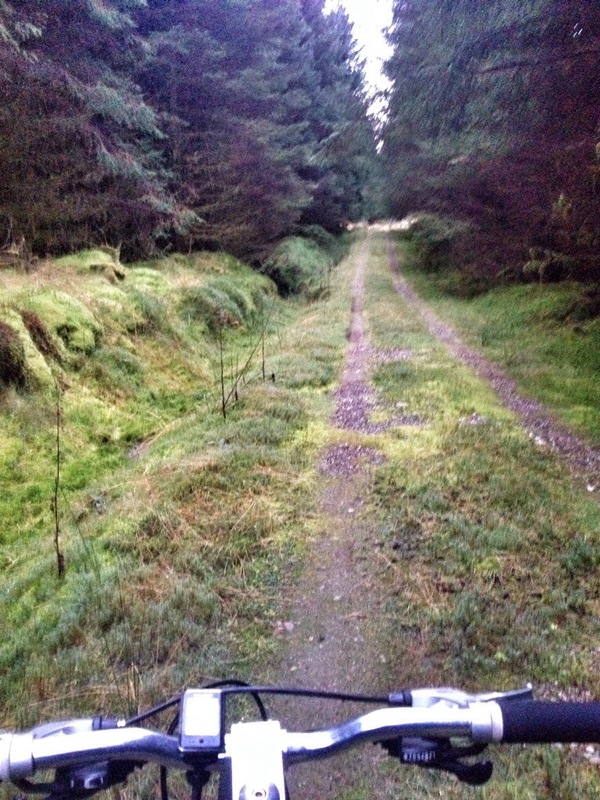 There’s also the option of a wee downhill track returning to the forestry road if you want a short cycle. Note, this is a shared track with other users. 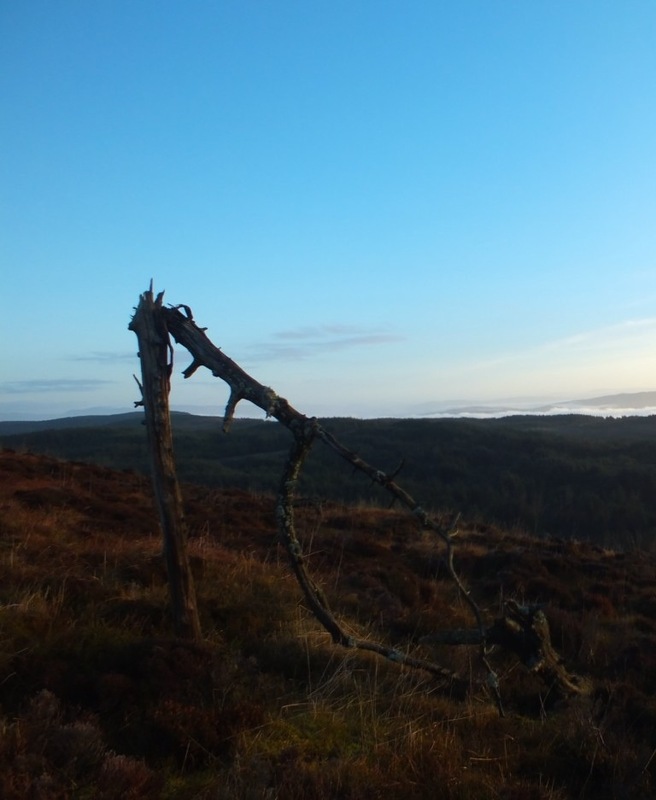 Continuing heading South is enjoyable and the climb above Ardhallow isn’t to bad. 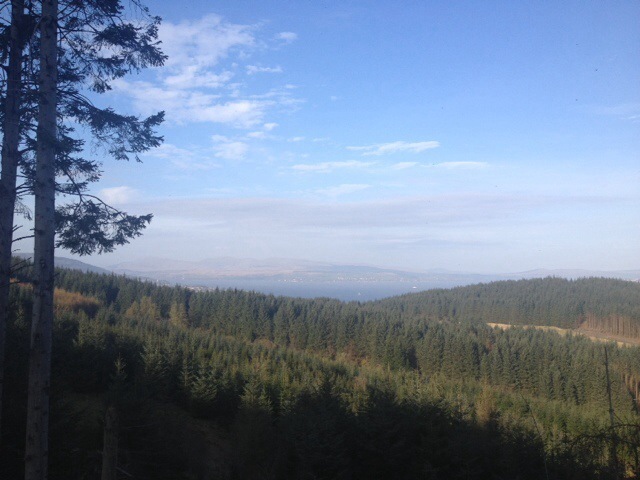 Just before the climb there’s the chance to look North towards Dunoon for a great view through the trees. Continuing to the quarry which has recently been active there are more great views over the Firth of Clyde. Finally before the descent to main road a view over Innellan and surroundings. As you continue south the road splits. Turning right takes you out to Auchafour at Toward, but today’s journey was destined for Innellan, taking a left down hill. 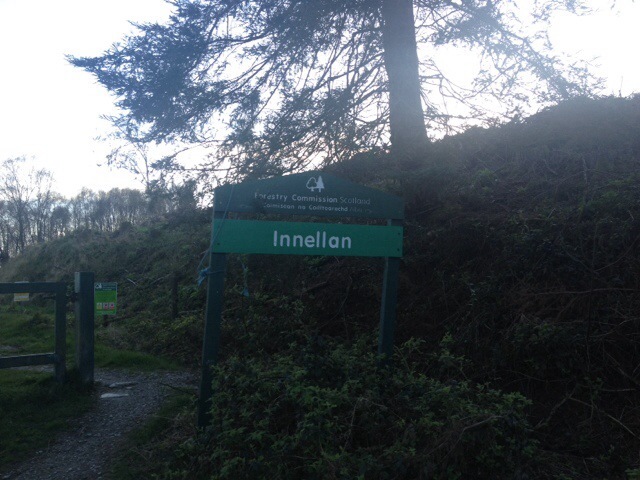 The descent to Innellan doesn’t take long with one more turn to the left, through a gate which takes you to the reservoir at the Golf Club continuing to Wyndham Rd. 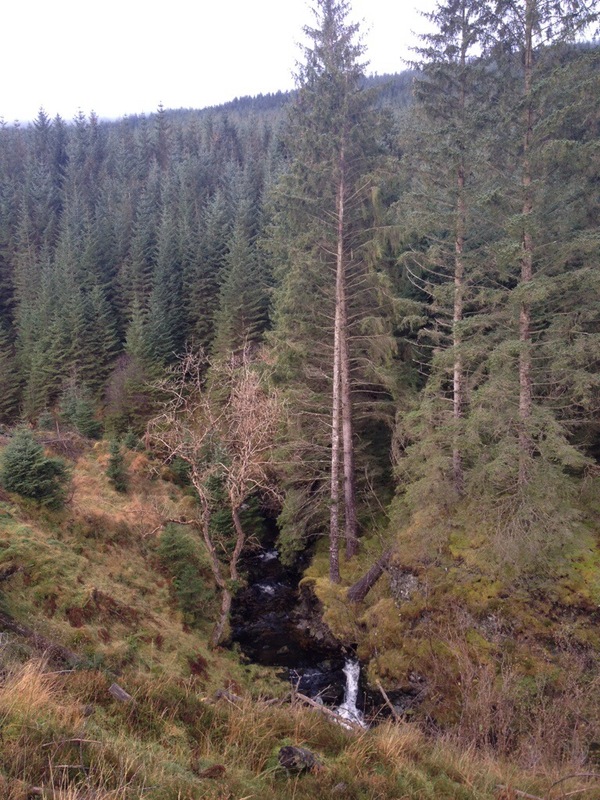 From the forestry road turn left onto main road , past the school and down Royal Brae. Before you start your return you can get refreshments from the local shop, or a choice of two premises selling meals and stronger refreshments!! 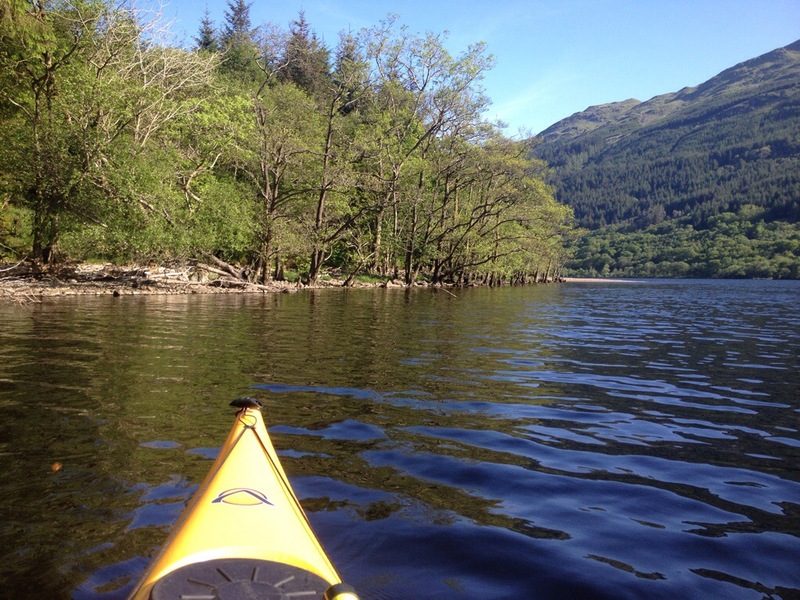 The return is easy, especially if the wind is behind you and you can be back in Dunoon in no time. 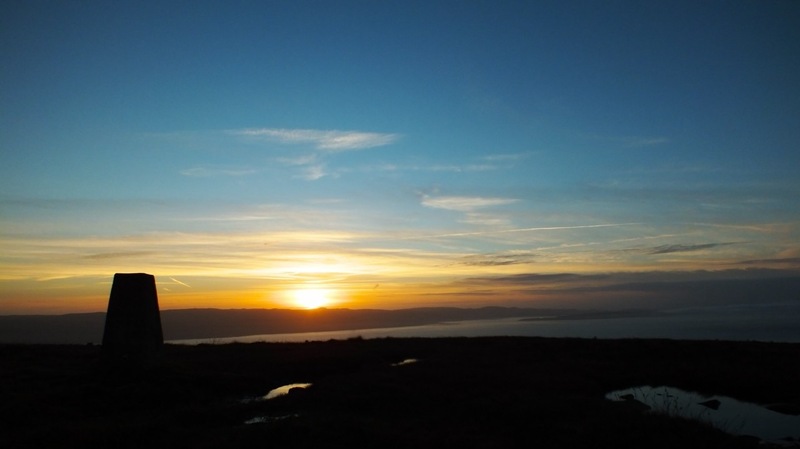 A great after work or a ‘few hours spare’ cycle that gives great views. 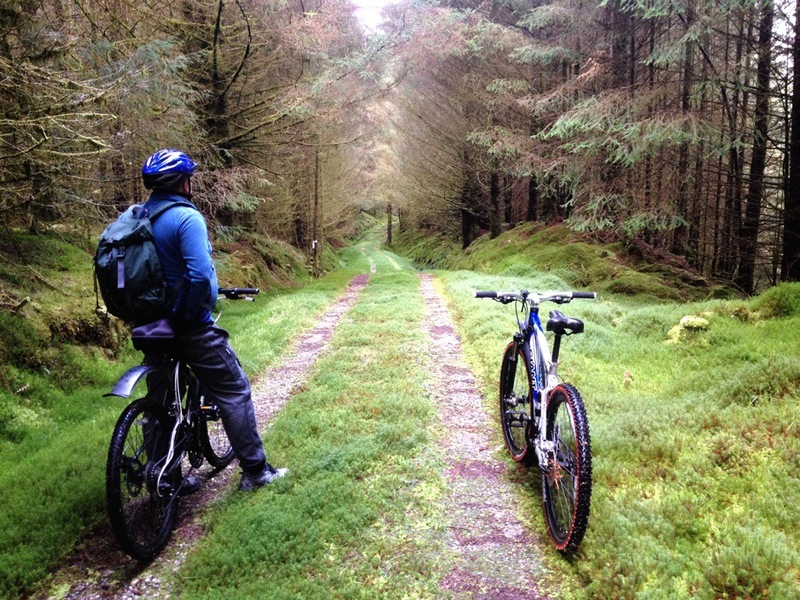 Always the option for adding more miles or returning on the forestry road if you like. 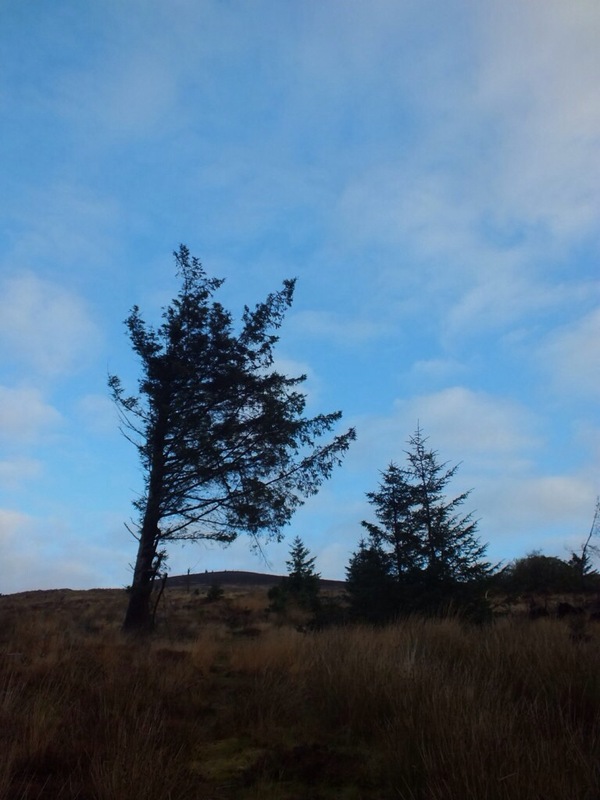 01/12/13 A trip out for a look at Mark Cottage Bothy.A bothy owned and maintained by the MBA. 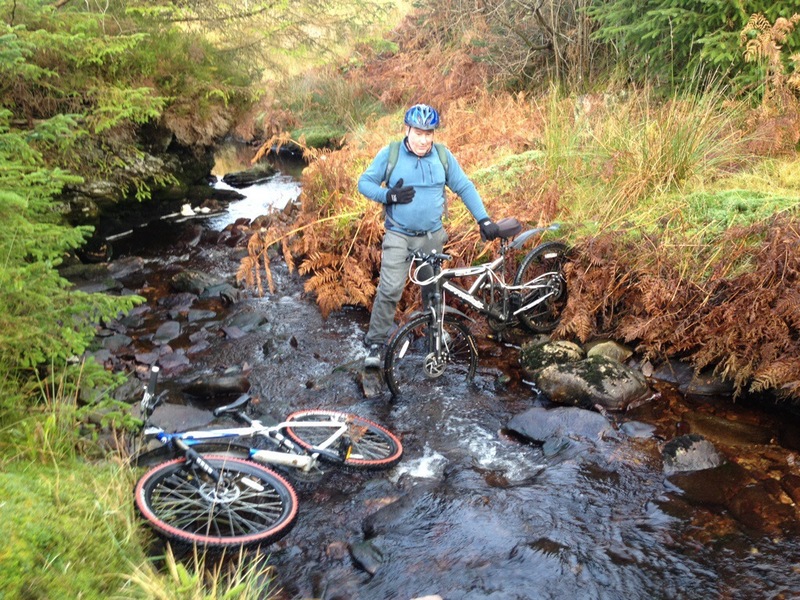 We set off from Ardgartan on a 7 mile cycle to Mark Cottage. 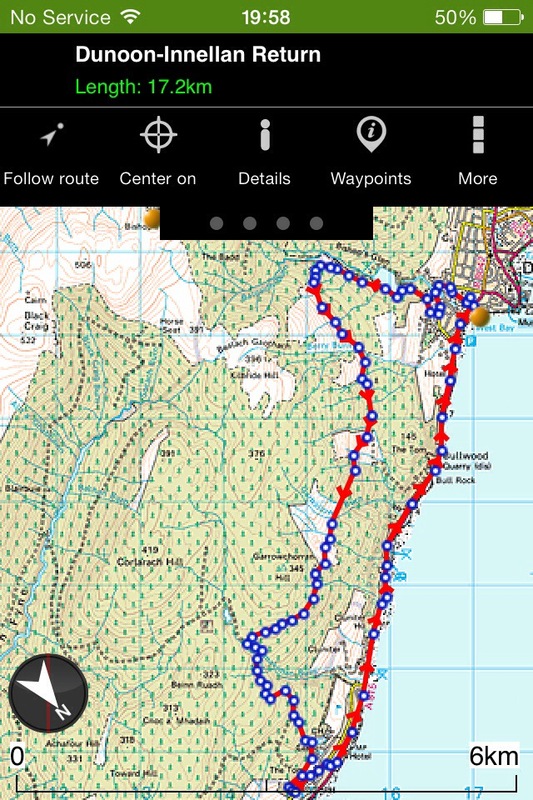 The return was the route reversed, giving a good 14 mile trail ….enough for a Sunday morning. 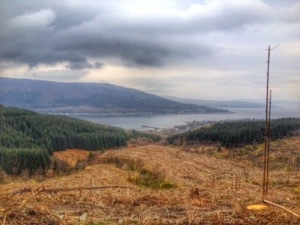 In the clearances there are great views of Loch Long, both North and South. 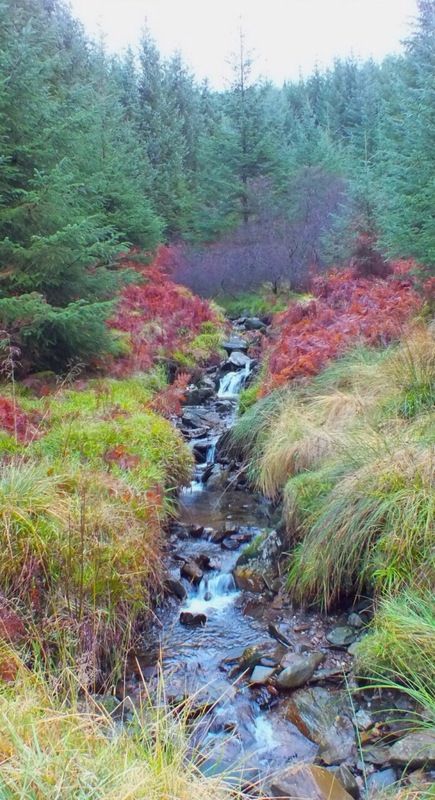 Also en route to the Bothy, there are numerous road side waterfalls. 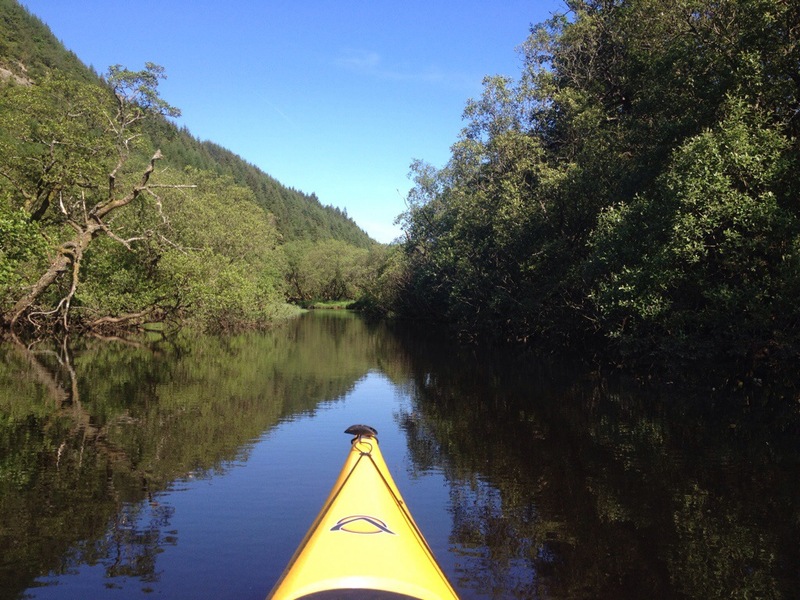 The reason for the visit was prompted by further plans to visit the Bothy by kayaking from Ardentinny. Suitable landing points were found close to the bothy and there’s enough fallen/dead timber lying about for that all important fire. A great bothy, the first ‘real’ bothy I’ve visited. Well laid out and kept clean by previous visitors and maintained by the MBA. 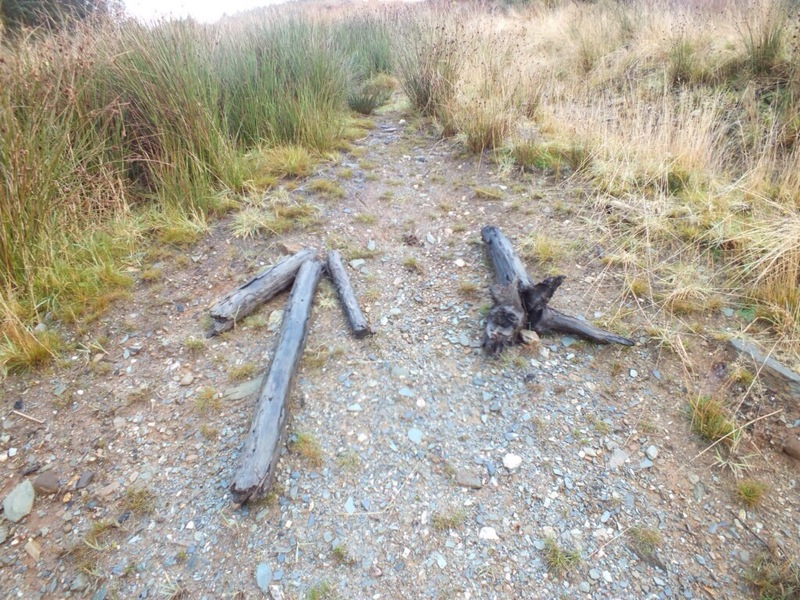 Fuel: Fallen timber in the area. Duration. 2hrs on the move, plus stops . Looking forward to getting out on my new purchase (well new to me) ,the bike was loaded into the back of the motor ready for an early start. 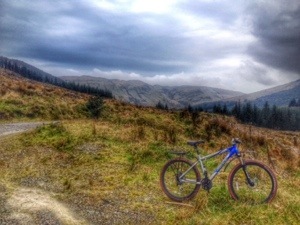 Headed for Glenbranter picking up Martin ‘Mears’ and his trusty stead en route. Parking beyond the FCS offices at the events car park it wasn’t long till we were on our way. Choosing to take the Blue route. 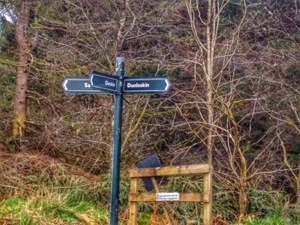 The Glenshellish Loop, a route suitable for beginners and families, approx 7 miles long. An ideal choice since I’ve not been on a bike for 10 years!! 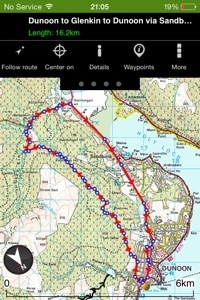 However in addition to this the Glenbranter Glen was added, giving an additional 3-4 miles. Heading towards Glenshellish Farm over the bridge and taking the road on the immediate right. 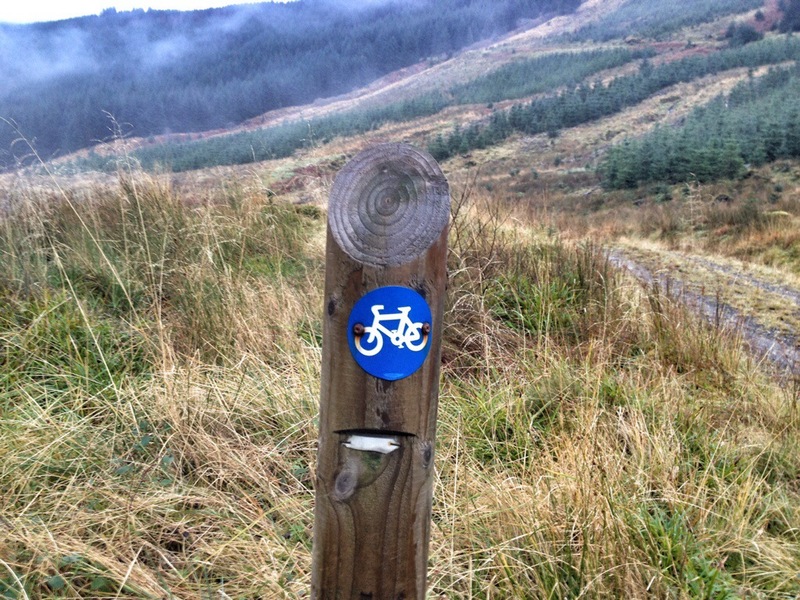 The route is well marked by posts at junctions, it continues up the East side of the Glen. 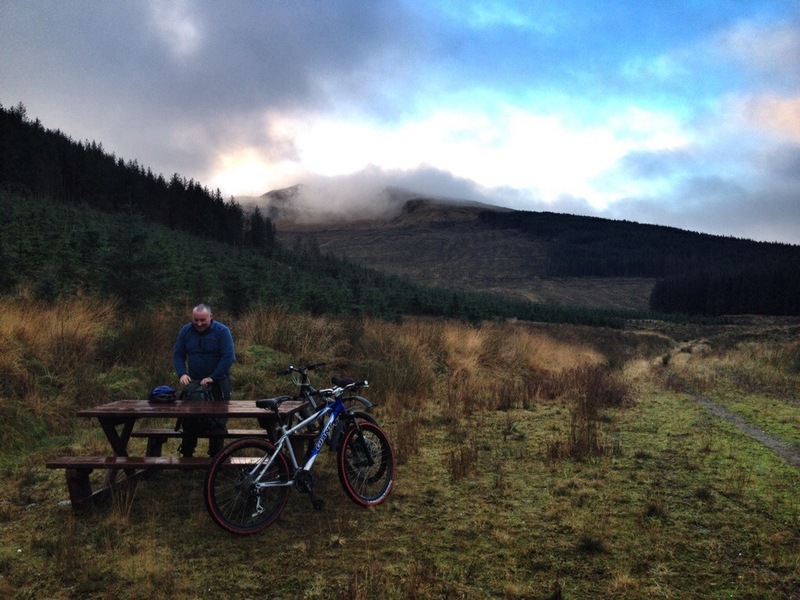 There is a picnic bench for a wee stop at 3 miles into the loop just prior to the Ford crossing. 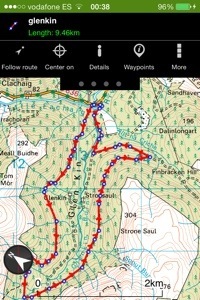 The return via the West side to Glenbranter was mostly downhill. Before heading back into Glenbranter we took a sharp left followed by a long climb then a sharp right, heading to Glenbranter Glen. 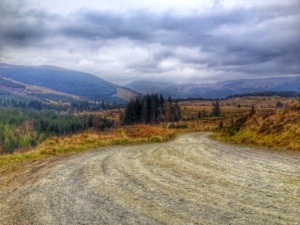 A road leads off this section downhill to the right, marked by both Red Route and Cowal Way markers. Again, at the bottom if the hill you follow the East side of the Glen on a less defined forestry road. Reaching the top of the Glen there’s a deep Ford to cross! 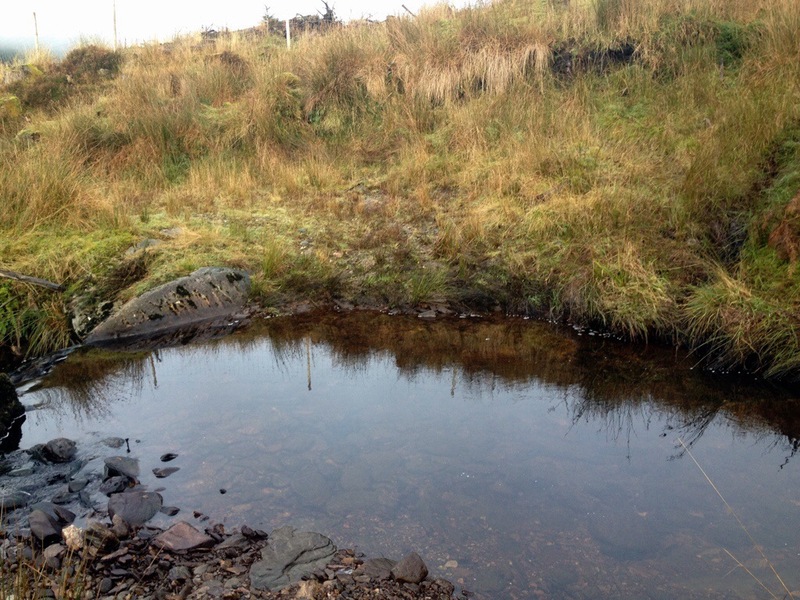 We however went up stream, crossing at a shallower narrower section. Once across, the going is not to bad. Another Ford in a dip must be crossed but at this time it had little water passing through it. The run back down the West side again, like Glenshellish was mostly downhill and good progress made. On the return we passed the Red Route again where the downhill section joins the road from the left. Continuing along the Red Route drops away to the right, unfortunately the lower section is closed for now due to wind blown trees. Beyond this a crossing where the roads meet lets we headed straight down the hill to the back of the Lauder car park, where we returned to the Events car park via a surfaced road. 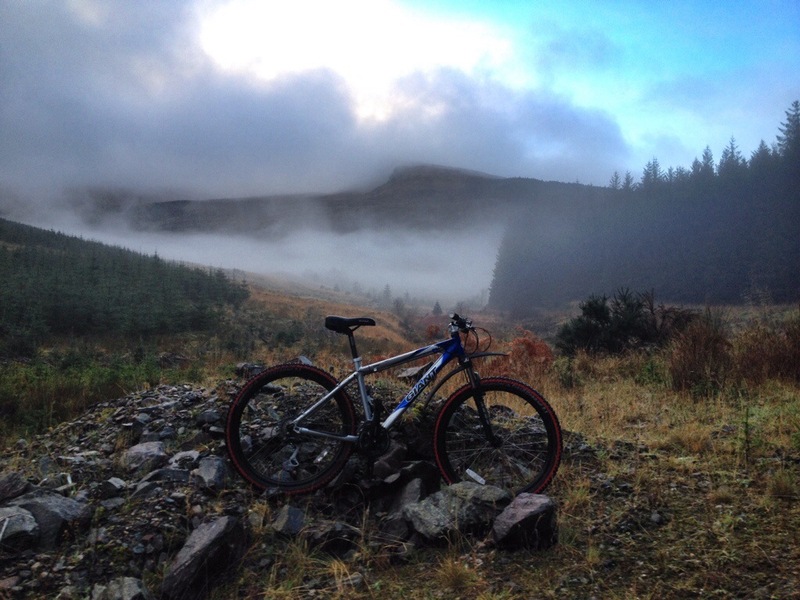 I great cycle today, especially as a reintroduction to Mountain Biking. Buachailean. Toward. Night walk reccy. 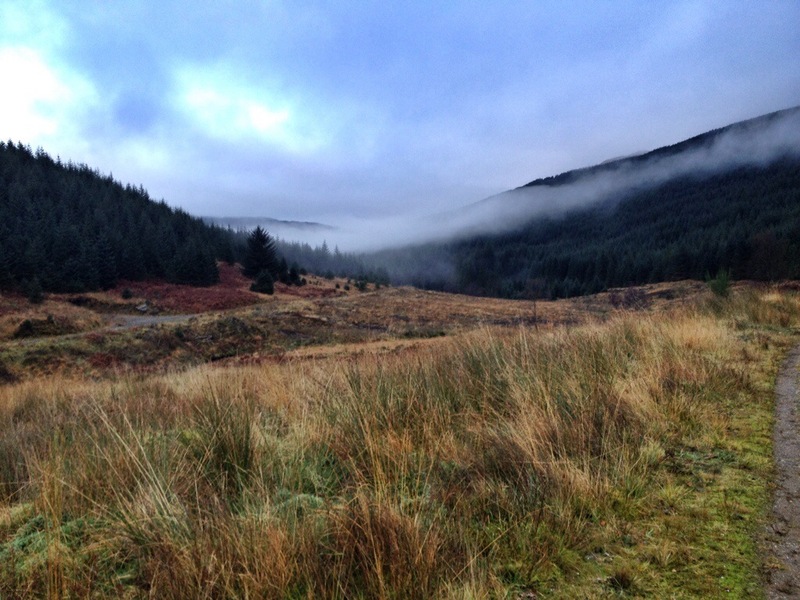 Target set for Buachailean on Sunday morning I parked at the Forestry Commission car park. Heading off at 07.20 I followed the way marked trail. Firstly the red/yellow/ blue/white markers. 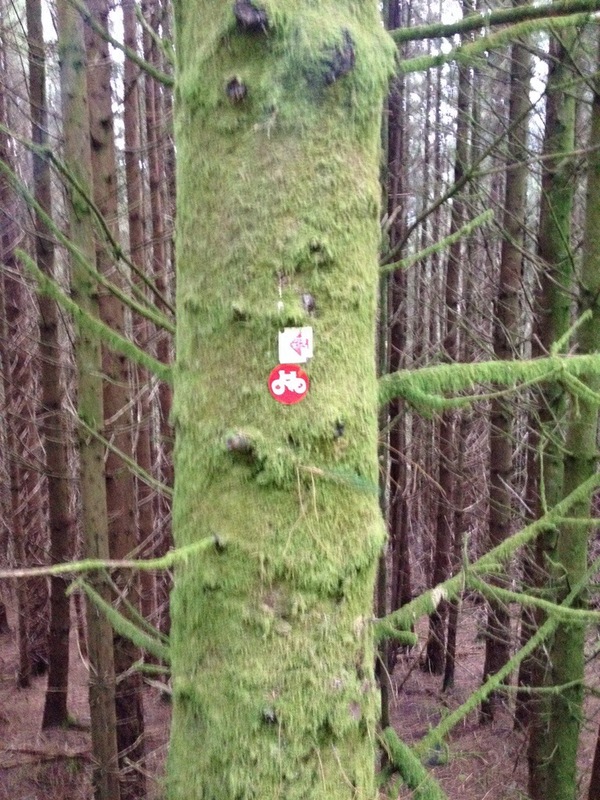 Then onto the red markers,before joining the blue and yellow that takes you in to the forestry road ( White markers). Now from here I headed straight across the road heading on what I thought was a trail marked on the O/S map. 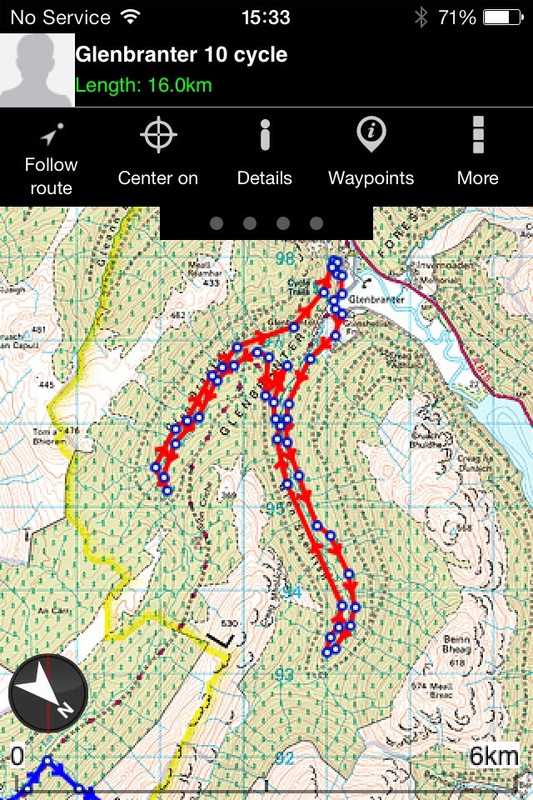 However, whilst showing on the map any evidence of any path on the ground is pretty much non existent. The forest has been harvested leaving no clear route. 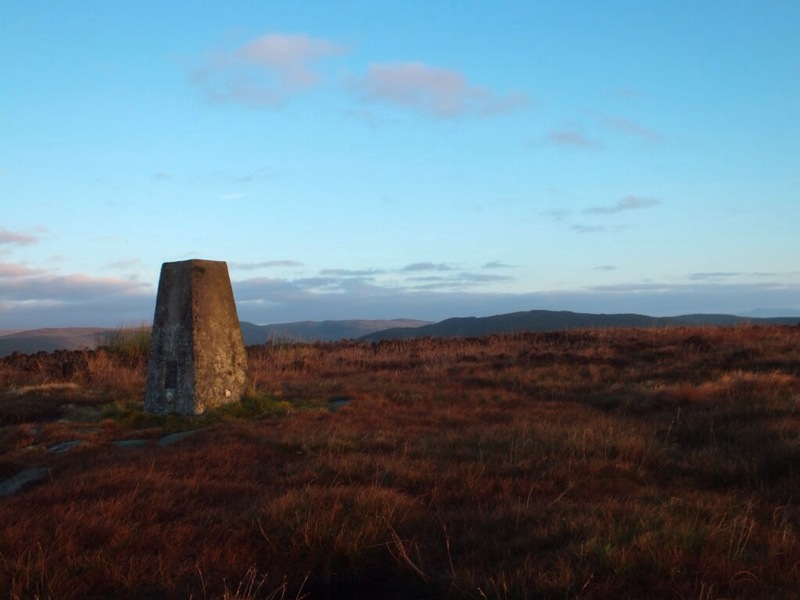 I did however continue on over brash,stumps and heather till reaching the summit. 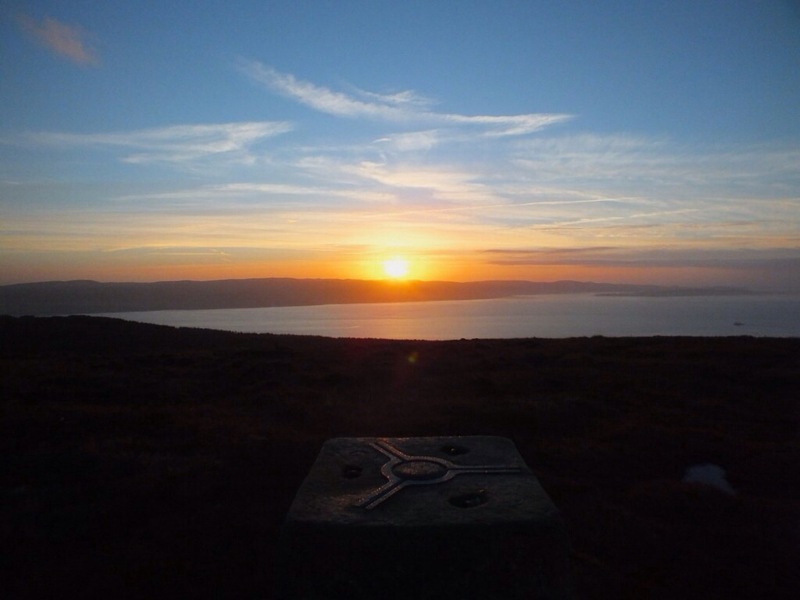 Overlooking street lit Bute en route to Summit. Was on the summit for 8am just in time for sun rise. Spent a wee while gettin some pics as the clouds developed along with the coastal mist. 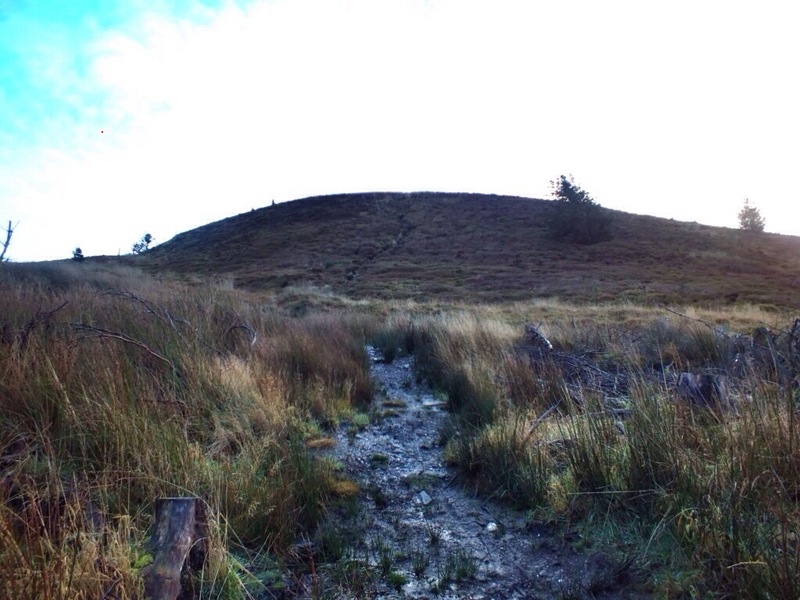 Whilst taking pictures and walking about the summit I noticed a well defined path on the west side of hill. 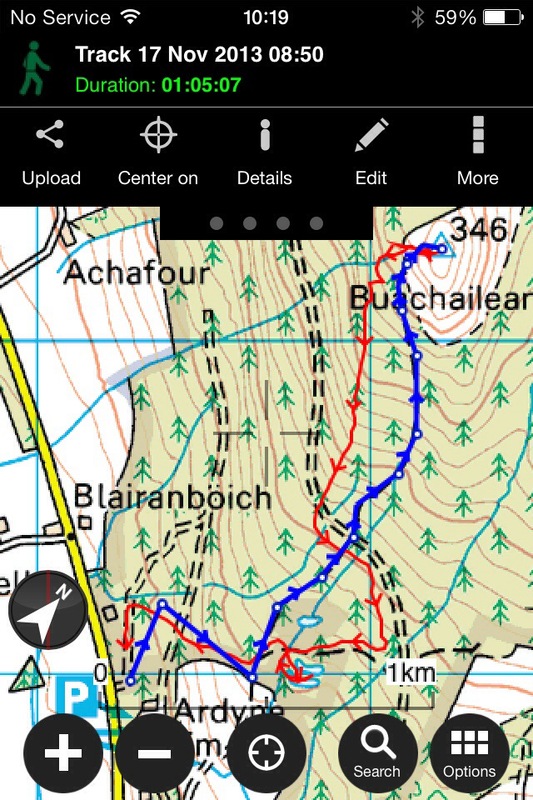 It lead down the a wall which ran downhill towards the forestry road………the route I should have taken instead of old non existent path!! From the wall looking back up to the summit. 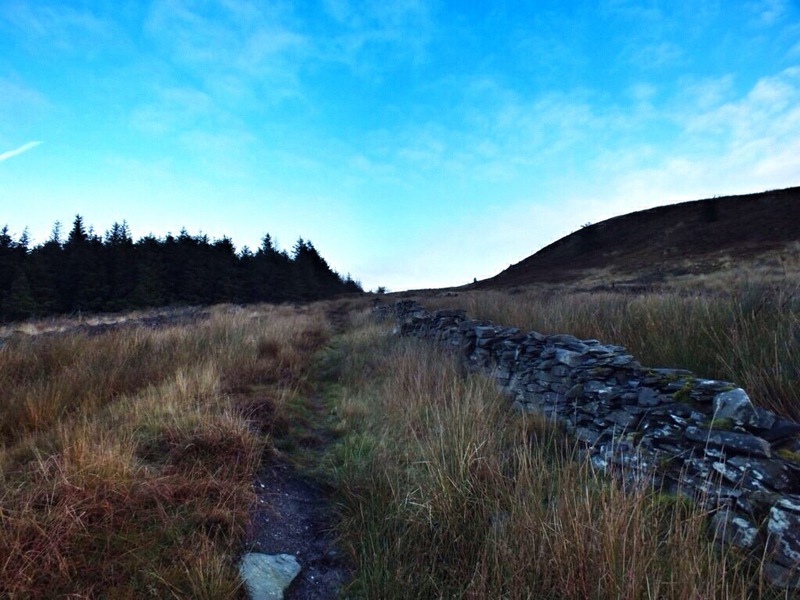 I returned back to forestry road following the wall all the way. Taking pics looking back as this should have been the approach route. Someone has even made this hand navigation aid,Ha. 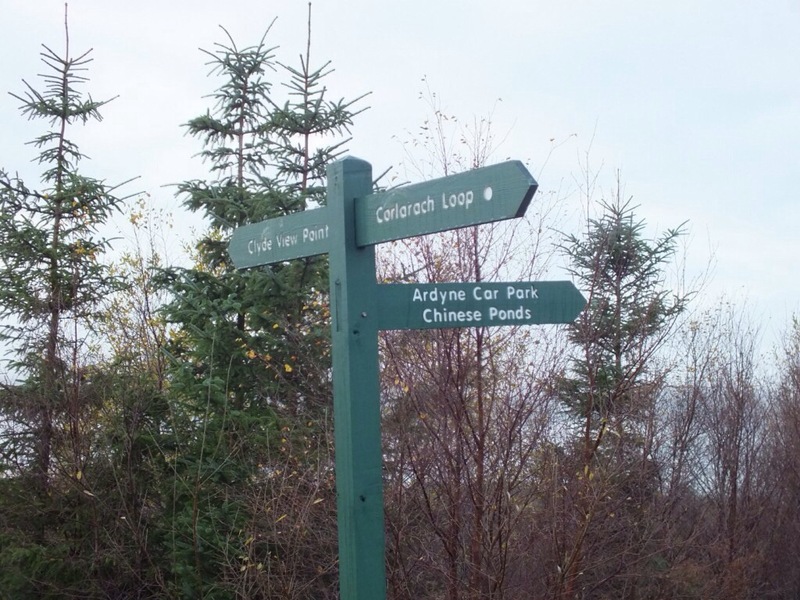 Once back on the forestry road I continued down to the Chinese Ponds. 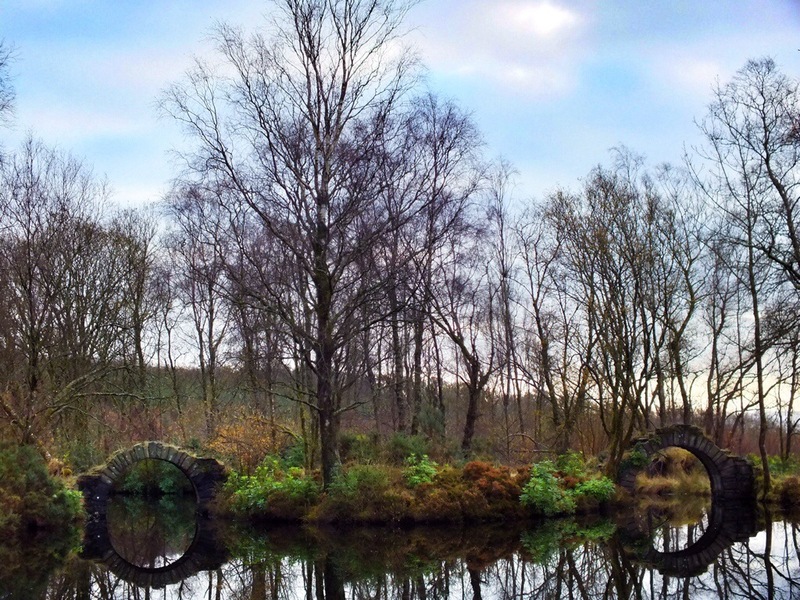 The ornamental bridges at the Chinese ponds. From here I joined the track for my return to the car park. Think it’s about 4.5kms all in so a good wee walk giving great views. 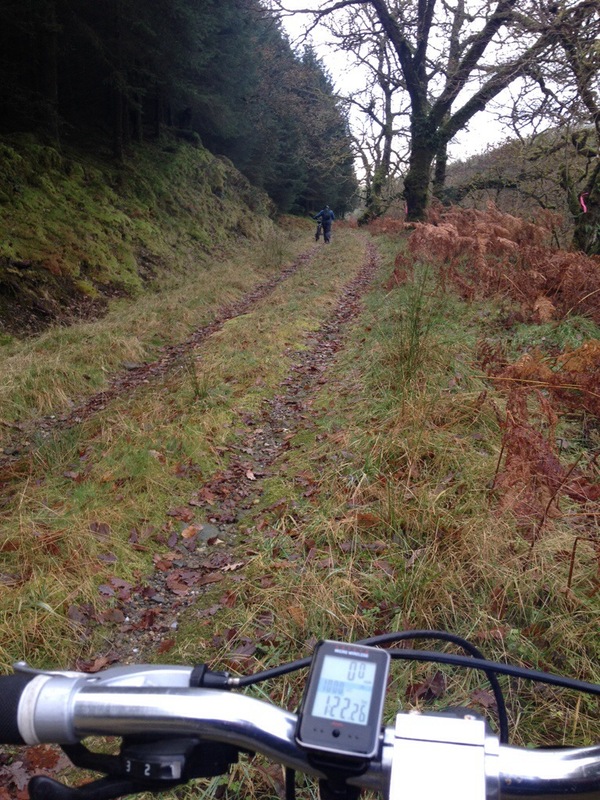 Top section once off forestry road showing Blue wrong route,Red correct route! !